Rocky Mountain National Park, Larimer County, Colorado, U.S.
Fall River Pass (elevation 11,796 feet (3,595 m)) is a mountain pass in the Rocky Mountains of northern Colorado in the United States. It is located in the Front Range, within Rocky Mountain National Park. The pass is traversed by U.S. Highway 34 on Trail Ridge Road between Granby and Estes Park. However, as at Milner Pass on the Continental Divide, the road does not descend after reaching the pass from the west, but instead continues to climb along a side ridge; thus, neither pass is the high point on Trail Ridge Road, which crests at 12,183 feet (3,713 m) east of Fall River Pass, still within Rocky Mountain National Park. On the other hand, the old, largely unpaved, and one-way-uphill Fall River Road (see adjoining map) does have its summit at Fall River Pass, where it joins the modern highway for the descent to the west. 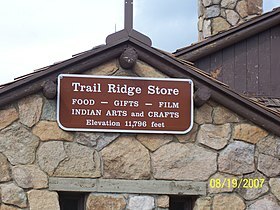 The Alpine Visitor Center, one of five visitor centers for Rocky Mountain National Park, is located at Fall River Pass. The highway has a moderately steep 6% grade on either side of this point. This page was last edited on 31 January 2018, at 23:20 (UTC).